or, Why I Love Concrete. designed by Bulgarian born Perth architect, Iwan Iwanoff (1919-1986), in 1968. 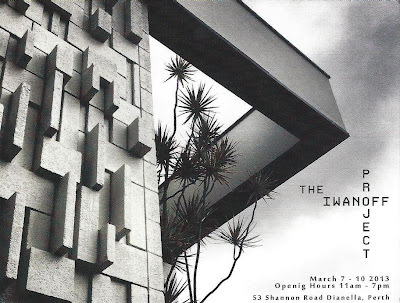 If you are unfamiliar with Iwanoff, in simple terms, he is Perth's darling of Modernist architecture. The West's own Harry Seidler or Robin Boyd, so to speak. Internationally he can be compared to Frank Llyod Wright. The Iwanoff Project in a nutshell was a Home Open with 'extras'. Contemporary work (and some vintage pieces too) by Australian artists and designers were displayed (and for sale) throughout the house. Talks and guided tours were also held. For me though, it was the house that stole the show. For someone like me who has long admired Iwanoff homes from afar, (read pervy 'drive-bys') this was not the time to shop! While its exterior may not be as 'out there' as others (examples here and here), just you wait! tile envy? sculpture envy? anyone? The cabinetry alone will knock your socks off! Marble, copper, teak - it's got it all! Yep, that's me perched on the loo - worth it to get a pic of that sink! I mean SERIOUSLY! Alfresco entertainment area. An innovative idea at the time. collect your mail from this mail box...I know I would! p.s. for even more of # 53, check out Patsy's post here. oh my lord my head is exploding with this magnificence!! Whoa! How about that intricate woodwork?? the sculpture? The pool? The form! The function! The outfits one could wear there! Oh dear I want to close my eyes and ignore my house now. I love your passion for this style Kylie! Will you be going to the auction? O, my FARKING gawd, I am going to accost G as soon as he has finished bashing his drum kit to show him this INCREDIBLE home!!!! That's pretty impressive! I LOVE the ceilings and the outside hang out area. One day people are going to be coming round yours with cameras though, I just know it! Pretty amazing, thanks for being such a good tutor on modern domestic architecture for me. You teach me so much. I like how the toilet rolls are stacked to follow the curve of the basin...that just tickles my funny bone. and the dog house is brilliant! (saw it on Patsy's post, following your link). It's an incredible house Kylie -not something I'd be comfortable living in (not enough clutter and kitsch for my very downmarket tastes) but blimey yes it's an architectural wonder. What an unusual house! Not my style, but I can appreciate the attention to detail and stylistic features which have been incorporated into the place. oh kylie...did you pack an overnight bag? ?...at least tell me that they had to kick you out!...that pool area!!. Its all just so fab!....postie came today....your a honey! I like everything, wow, wow and wow! Sculpture envy - yes! I'd never want to leave the house if I lived there. Imagine the parties, and imagine how stylishly you could dress just to eat toast by the pool. I bet you did some daydreaming during your visit. It is so clear how much this design influences you. Oh goodness me, Kylie, what an absolute gem!!! The house is amazing and I'm totally in love with that Kosturkov sculpture, that's an artist I have to check out! Oh my its amazing!!!! I have just got Warren over to have a peek too! Amazing!!!!! Oh my gosh it's AWESOME!!! ALL of it! It's a stunning house. That room divider is just amazing. I will join you for cocktails any day! AMAZZZZZZING! What did the sculpture go for? Hey Kylie, the wonderful Floreat house has just come on the market and is open for the first time on Saturday, auction in late April! Really good house tour Kylie. I like your pictures a lot. There is so much that is incredibly creative about this house. The thing that turns me on the most is the use of the Brutalist elements throughout... the entrance, the sculpture, the concrete block wall. I have honestly never seen anything like that before. The pink and white tile behind the toilet paper roll of people's dreams is neat as well. Almost looks art deco? But it can't be? Right? Amazing, thanks so much for sharing! Did you see the floreat house ? Every man and his dog were there when I went, could not even take any pics! Still fab tho. so... that was right up your street, wasn't it? but yeah! gosh... and gulp. Can words really describe this gem! Wonderful design!!! You know how sometimes when I love something so much I feel physically sick? Well, I've suddenly felt deathly. I'm groaning here at the spectacularishness of that house. How can people be so talented?! Call an ambulance someone! !